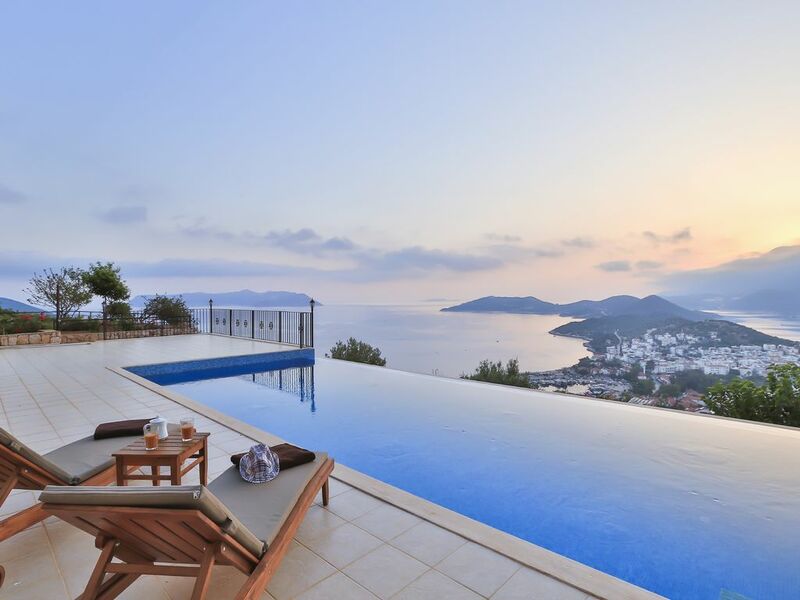 Penthouse The Grand is a two storey apartment set in the hillside of Kas town on the Turkish Riveria. It provides a peaceful relaxing retreat with bathing terraces and infinity pool for soaking up the sun. And a full length front balcony for taking in the views whilst enjoying breakfast or an evening drink. Yet you are within walking distance of the town and all the amenities. The old town streets with their boutiques and the many restaurants and tea gardens which are pleasantly shaded and ideal for watching the world go by. On the entrance level of the penthouse are two double bedrooms and a large open area with the kitchen, dining and lounge area which extends to the roof. There is a sweeping staircase which then takes you up to the third double bedroom. The penthouse is well appointed and has been furnished to a high standard. It is very spacious and walking through from the lobby to the open plan living area you can't help but feel drawn by the vista before you. I'm originally from the west coast of Scotland but I've been living in Kas for the last two years. My husband, Omer, and I have a property and home management company - Alba Property. I really enjoy living here as it is such a beautiful place and the people are so friendly. It is wonderful to wake up in the morning to blue skies and amazing sea views. It is a very chilled out place. It makes a change from London where I spent the last 10 years. The master bedroom en suite has shower, toilet and sink. The second bedroom en suite has a bath with shower fitting, toilet and sink. The third bathroom on the entrance level has a shower, toilet and sink. The lounge area has a large l-shaped seating area which allows you to recline in comfort and enjoy the views. There is a TV with digital TV channels and also wi fi internet. The kitchen is well equipped with hob, oven, fridge, freezer, microwave, dishwasher, kettle, toaster and cafeteria. Notes on accommodation: The penthouse is managed by my husband and I, Alba Property, so should you require any additional pieces of equipment (baby's bed, high chair etc) which are not mentioned or need assistance with planning your holiday please let us know. Outside: The penthouse apartment block sits in a small exclusive residence of 9 apartments with well maintained gardens, large pool side bathing terrace and an infinity pool. Sun loungers are provided for poolside use and there is outside seating furniture for the balcony. Utility Room: There is an utility area with washing machine and iron/ironing board. Cleaning / Towels / Linen / Maid service: The penthouse will have towels and linen supplied. If you are staying for more than 10 days the penthouse will be cleaned and linen and towels changed midway through your stay. Additional housekeeping and laundry services can be arranged if required. Other: There is a 6 seater dining table for dining inside and plenty of space on the balcony for dining alfresco. Penthouse the Grand is an amazing 'light & airy' apartment on the hillside above Kas. Owners Omer & Hilary made us feel very welcome and supplied us with all the information we needed. The apartment is fitted out to a very high standard with all rooms having plenty of good air-conditioning. The beautiful infinity pool was 'base' for the kids when we returned from the beach and this provided us with incredible sunset views in the afternoon an evenings. The views from the balcony where frankly breathtaking and this is a huge plus for the location and aspect. This would be one place we would return to. Great apartment in a fantastic location. We had one of our best ever holidays staying at this property. We are a family of 5 with 3 teenagers and the penthouse was amazing, totally spacious with plenty of space for everyone. The accommodation is very high spec a definite 5 stars. The location is ideal with fantastic views - there is a steep road down to the town but we hired a car so this was not a problem and there are plenty of taxis if you don't want to hire a car. Hilary and Omar were great nothing was a problem from getting making sure we had provisions upon arrival, helping with restaurant bookings and even an emergency call out when one of our children locked the keys in the apartment! Kas is a really lovely authentic town we were really impressed the beach platforms are great and we all even swam with a turtle 😀 The restaurants are reasonable and there are plenty to choose from. Overall a fantastic apartment and resort - we will definitely be back!! Thanks for making our holiday so special. Kas is perfect for flicking the off switch and just relaxing and recharging your batteries as you watch the world go by however it also has a lot to offer for those who prefer activity and to learn new skills. There is walking, cycling, yoga, paragliding, kayaking, sailing and scuba diving - the diving in Kas is held to be the best in Turkey. There are also several atelier and artist workshops in the town and surrounding villages providing the opportunity for painting, pottery and photography. We are happy to assist with arranging any activities you would like to undertake. And if you can't resist the Turkish cuisine and want to learn a few recipes to take home with you so the holiday flavours can continue then why not spend some time with a local chef! The closest beaches to the penthouse are small pebble beach (kucuk cakil) and big pebble beach (buyuk cakil). Small pebble beach is a 5 minute walk and big pebble about 20 minutes. Other local beaches are Incebogaz, Olympos Plaji and Akcagerme Plaji. The dramatic Kaputas beach is a short drive towards Kalkan. It is a beautiful sandy beach found at the foot of a ravine. Further afield but certainly worth a visit is the glorious award winning 18km sandy Patara Beach. The closest airport is Dalaman which is about 2 hours drive from Kas but Antalya airport is a good alternative at 3 hours. From Dalaman airport it is a fairly straight drive on the D400 direct Fethiye and then on Kas. It is fairly popular to arrange a transfer or hire a car. We can help with your travel arrangements if you would like. We will provide further details when you have arranged your travel. There are many activities which can be carried out from Kas - diving, paragliding, cycling & walking. Kas is situated in the ancient region of Lycia so there are also plenty of places of historical interest to explore nearby; Myra (town of St Nicholas where the legend of Father Christmas started), Xanthos (capital of the Lycian region and now UNESCO World Heritage Centre), Patara, Kekova (sunken city), Simena, Arycanda and many more... Saklikent Gorge (hidden canyon) is a 40 minute drive. Kas has a true cosmopolitan feel as there is a wide variety of nationality of tourist with Turkish making up approximately 60%. This ensures that Kas retains the essence of a traditional small Turkish town. There is no mass market tourism so most visitors are independent travellers and small walking or cycling groups. There are several supermarkets in Kas for grocery supplies, a good fruit & veg shop stocked with local seasonal produce, several bakeries and fishmongers. There is a vibrant and busy market every Friday which sells everything from clothing, iron and woodwork, bedding and rugs to fruit, veg and local cheeses and olives. There are stalls selling the traditional savoury pancakes (gozleme). There are several historical areas in Kas with Lycian tombs scattered throughout town and the ancient amphitheatre which has been restored to its original form. The centre of the town around the square and the old harbour has lovely narrow streets which are refreshingly shaded from the stronger summer rays. Perfect for strolling and looking around the boutiques and admiring the many bougainvillea which seem to be constantly in bloom. There are plenty of cafes and tea gardens in which you can sit and watch the world go by. The many restaurants offer a wide range and high standard of cuisine which make it very difficult to have a “favourite”. The new marina opened in 2011. There is a lovely landscaped area with a promenade, several restaurants, supermarket and spa for the traditional Turkish Hamam experience. Booking Notes: At time of booking a non-refundable holding deposit of 20% will be required with the balance being payable 8 weeks before your holiday start date. A €200, returnable damages deposit is required. End of stay cleaning and linen package (€150) are not included in the prices. Changeover Day: We prefer a Saturday changeover but can flexible depending on other bookings. The check in time is 2pm and check out is 11am. Notes on prices: The prices are Euro and are for the rental of the apartment.